Camper Stabilization Product also prevents theft. Using turnbuckle handle for lock down, FastGun Wobble Stopper reduces camper movement, prevents jackleg and frame stress, and serves as anti-theft device. Brace bridges camper frame to jacklegs to prevent side-to-side movement, thereby eliminating subsequent damage to camper frame and jacks while also preventing hardware from becoming lose within frame. Offered in high impact powder coat white, product is constructed of aircraft grade aluminum and stainless steel. SUMNER, Wash., — Torklift International released a new Wobble Stopper camper stabilization product using the FastGun turnbuckle design resulting in the ultimate solution in camper stability and theft prevention. The FastGun Wobble Stopper reduces camper movement, prevents jackleg and frame stress, and serves as an anti-theft device. 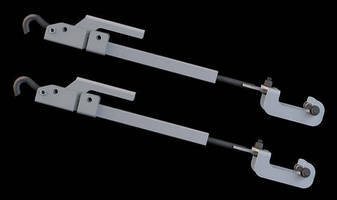 The FastGun Wobble Stopper serves as a brace bridging the camper frame to the jacklegs to prevent movement. It uses a FastGun turnbuckle handle to instantly lock it down. It’s also a theft deterrent device while the camper is in storage. The FastGun Wobble Stopper comes in high impact powder coat white and is composed of aircraft grade aluminum and stainless steel. It also features a newly designed jack attachment for round and square jacks making installation easier. It comes with Torklift International’s lifetime warranty and is made in the US. Torklift International is a Sumner, Washington-based manufacturing company. They produce aftermarket parts for the RV and automotive industries. Products are backed by their legendary lifetime warranty and proudly made in the USA. Founder Jon Kay established Torklift International in Kent, Washington.